The Urban Edge Studio of SW+A recently completed the landscape architectural design for the James E. Clyburn Research Center at the Medical University of South Carolina (MUSC). UES worked with Columbia based architects Stevens and Wilkinson and Boston based architects Goody Clancy on the overall design. The James E. Clyburn Research Center is comprised chiefly of the Drug Discovery Building and the Bio-Engineering Building. The site is located near the heart of campus at President and Bee Streets in downtown Charleston and was previously a surface parking lot. The project is slated to be certified as LEED Silver. The project, from a landscape architectural aspect, is comprised of four main areas: the front plaza, the Medicinal Garden, the North Garden and the MUSC Urban Farm. The large front plaza(http://www.postandcourier.com/article/20111121/PC1602/311219923) addresses the challenge of transitioning from the grade of the street to the required building elevation and accommodating major pedestrian axes while creating an area for sitting, eating lunch, having a conversation with a colleague, or as a respite from the laboratory and the classroom. The landscape addresses many of the sustainability aspects of the project including water quality, reduced irrigation, reduced urban island heat effect, and use of local and recycled materials. Located to the west of the Drug Discovery Building, between the Basic Sciences Building and the Colbert Library is the MUSC Porcher Medicinal Garden. This area was previously a loading dock area and has been raised about 3 feet to the grade of the surrounding buildings. (http://waring.library.musc.edu/exhibits/PMG/about.php). The garden is a tribute to Dr. Francis Peyre Porcher, an MUSC alumnus and professor who served as a physician during the Civil War. The garden is planted with more than forty species of plants selected from those cataloged in Dr. Porcher’s Resources of the Southern Fields and Forests (1863). Each plant grouping has an interpretive sign that provides information about its medicinal uses. The plants are located in raised planters of Cor-Ten steel, allowing visitors to have a close up view of each plant. 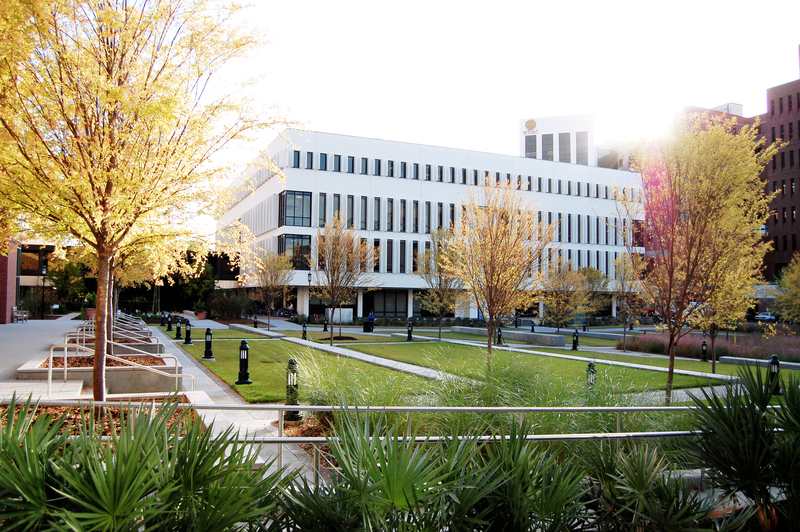 The North Garden serves as a place holder for future buildings, as called for in the campus master plan. It also provides one of the largest open space areas on the campus and the surrounding neighborhood. Several large live oaks, once confined to parking lot islands, were preserved and incorporated into the layout. Sidewalks, benches, and plantings – mostly native species create a comfortable campus landscape that is enjoyed by many on a regular basis. Located within the North Garden area, just behind the brick wall on Bee Street, is the almost half acre MUSC Urban Farm. The urban farm was developed with the following Goal Statement: “The MUSC Urban Farm will be a place that cultivates a healthier community by growing crops and social connections while educating and inspiring people with local, nutritious, and delicious food.” UES worked with MUSC staff and Elizabeth Beak of Crop Up (http://www.crop-up.com/) to bring the farm into existence. MUSC conducts “Work and Learn” session where people can learn about eating healthier and growing their own food while taking home some of the food they have harvested. The farm is designed with raised beds, drip irrigation, and mulched pathways. Over 50 varieties of heirloom herbs, fruits and vegetables are raised year round in the farm area. According to project manager Wade Gatlin of MUSC, “this $80 million project has fundamentally raised the bar on design excellence in terms of architecture and landscape architecture for the MUSC campus.” He also said that he “can happily recommend Urban Edge Studio for their ability to engage clients in thoughtful goal setting and consensus building, for their highly detailed solutions and their overall creative vision.” This project, which lasted over five years from beginning to end, presented many design challenges which the UES design team (Bill Eubanks, Russ Seamon and Haley Weeks) met with creativity, insight, and innovation. The design for MUSC Specialty Care East rooftop garden was a unique design challenge. With the structural integrity of the building in mind, our Landscape Architects worked closely with a local fabricator to create ultra-lightweight planters and a custom lightweight soil blend that could be placed on the rooftop with confidence. Plant pots were created of a specialty material called star board that is often used in marine cabinetry then arranged into a beatiful rooftop garden. The building, designed by Architecture firm Stubbs, Muldrow, Herin & Associates, and the grounds were developed with an environmentally sensitive approach using LEED principles.